User-friendly text and clear instructions show employees how to prevent accidents and injury whilst maintaining a healthy working environment. Durable laminated construction with full colour illustrations. Compiled by qualified health & safety practitioners. 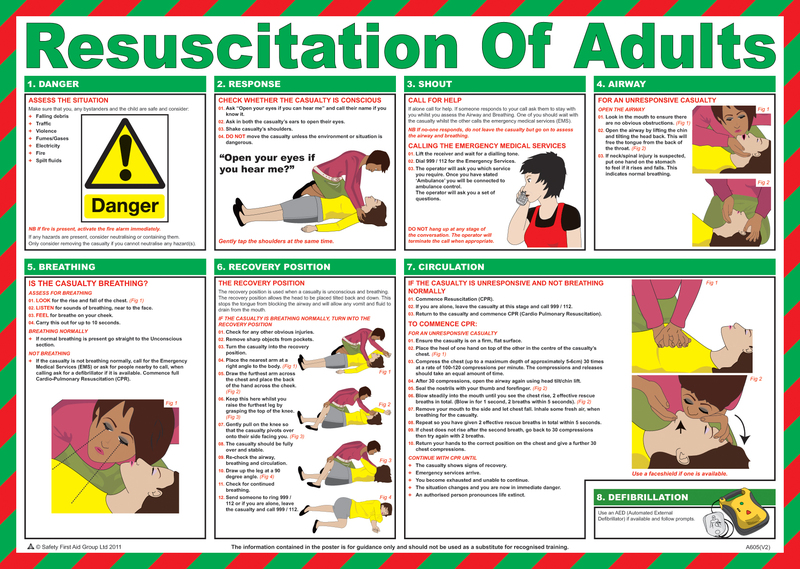 Sign Text: Resuscitation of Adults Poster. Protect Your Employees And Avoid Costly Accidents. 590mm or approximately 24" wide. Interior signs are suitable for use in interior applications. Home signs are suitable for use at home. Office signs are suitable for office use. School / College signs are suitable for use in educational establishments, schools, colleges, universities. Factory signs are suitable for use in factories. Warehouse signs are suitable for use in warehouses Restaurant signs are suitable for use in a restaurants. Catering signs are suitable for use in a catering / kitchen environment. Farm / Agriculture signs are suitable for use in farming and agricultural environments. Garage / Motor Trader signs are suitable for use in a garage or motor trade environment. Shop / Retail signs are suitable for use in a shop or retail environment. Construction site signs are suitable for use on building and construction sites. Hotel signs are suitable for use in hotels and bed and breakfasts. Hospital signs are suitable for use in a health care environment; hospital, clinic and NHS establishments. Mines / Quarries signs are suitable for use in mining and quarry environments. Suitable for mounting on a wall Suitable for mounting on a smooth surface Suitable for mounting on a flat surface. Posters are signs with a larger quantity of information, normally used for general health and safety messages.